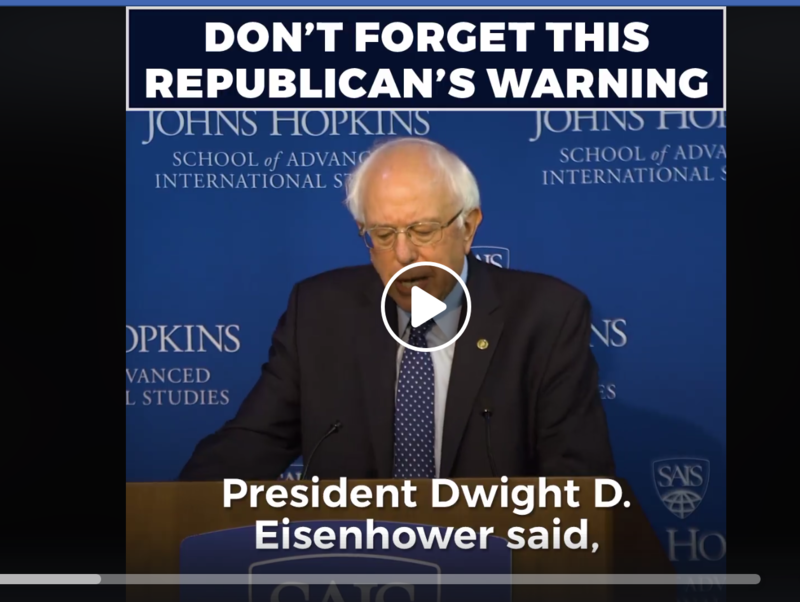 Bernie Sanders has added the existence of foreign policy onto the bottom of emails like the one below, after having posted a video of himself quoting the usual Eisenhower quotes on military spending. These changes match the request made when World BEYOND War and RootsAction.org asked 100 prominent people to sign an open letter to U.S. Senator Bernie Sanders urging him to address military spending. Over 13,000 more people signed it. Let’s hope that Senator Sanders builds on this progress. Let’s take the same demand to other politicians. Protect American democracy: Repeal Citizens United, move to public funding of elections and end voter suppression and gerrymandering. Our goal must be to establish a political system that has the highest voter turnout in the world and is governed by the democratic principle of one person – one vote. Take on the billionaire class: End oligarchy and the growth of massive income and wealth inequality by demanding that the wealthy start paying their fair share of taxes. We must rescind Trump’s tax breaks for billionaires and close corporate tax loopholes. Women’s rights: It is a woman, not the government, who should control her own body. We must oppose all efforts to overturn Roe v. Wade, protect Planned Parenthood and oppose restrictive state laws on abortion.